In the past, when I've made kebabs, I've done the vegetables on separate skewers. That makes it easier to get the meat and vegetables done the way we like them. But this was a weeknight. I didn't want to fuss. And I was serving it on a salad (!) rather than rice or couscous. Cutting everything into smaller squares allowed it all to cook quickly, getting the chicken done without overcooking the vegetables. As to serving it on a salad? Marinade: Mix Teriyaki marinade, soy sauce and sherry in a large bowl. Cut chicken into small cubes, about an inch (2.5cm) square, add to marinade. Clean mushrooms, remove stem and leave whole, add to marinade. Cut onion and remove inner layers, leaving 2 – 3 outer layers intact. Reserve inner layers for another use. Cut outer layers into squares of about an inch (2.5cm), add to marinade. Cut pepper into inch (2.5cm) squares, add to marinade. Allow to marinate for 10 minutes or up to several hours. 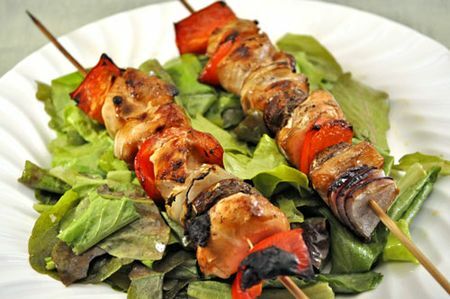 When ready to cook, thread chicken and vegetables onto skewers, alternating. Cook on barbecue grill for 8 – 10 minutes, turning once. Vinaigrette: Put peanut butter, sherry vinegar, soy sauce and walnut oil in a small bowl. Whisk well. Slowly add olive oil, whisking to incorporate. To finish: Wash and spin dry lettuce. Put into a large salad bowl. Add vinaigrette to lettuce, tossing well to combine. Divide lettuce onto 2 plates. Top with Kebabs and serve. Ever wonder why it seems to take so long to accomplish what should, on the surface, be a simple task? 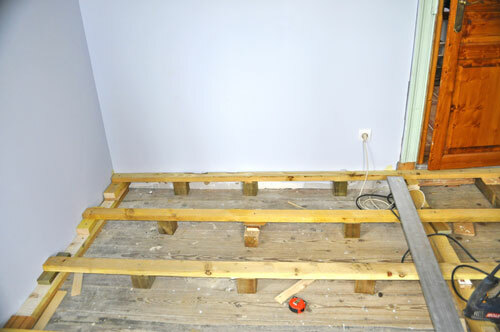 I thought I'd show you how mon mari is building the level supports for the floor in the dining room. This is the interior corner. As you can see the support beam is resting on the floor. 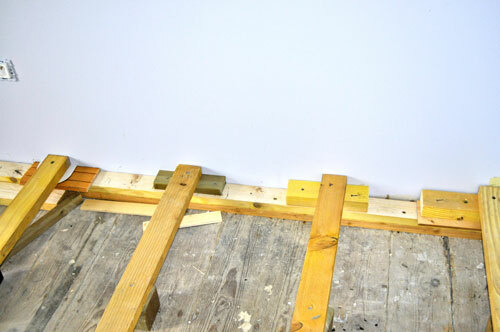 Moving towards the door going into the hall, the supports under the floor beams are about 3 inches high. Continuing on the the outer wall, the supports are about 5 inches high. 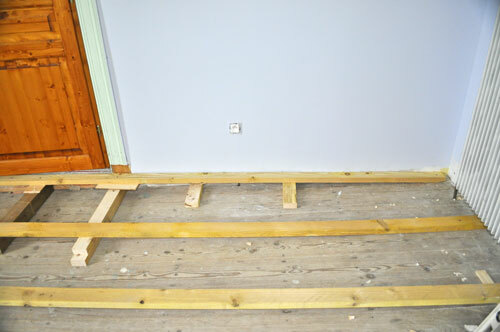 Turning the corner, heading towards the window, the old floor rises up to meet the new floor. You can see that the supports go from 3 boards to a thin board and piece of cardboard. Plus, it's not a straight, albeit slanted, line from point A to point B. 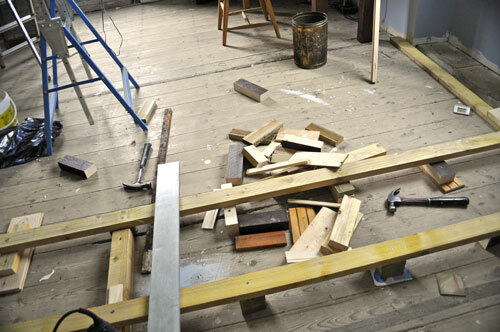 The under-floor undulates, forcing him to measure and support at intervals along the beams. Fortunately, he's save a few scraps and bits to use for this endeavor. After a week he's about a third done. Once he gets all the main boards level, he can fill in, do the insulation, and then, and only then, start to lay the wood floor. Love the idea of serving them on a salad. Love seeing your progress. Katie – that is a lovely kebab and salad – delicious looking! 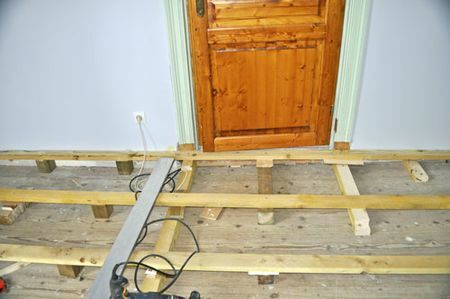 I did not realize what was involved in laying a floor – that looks like a daunting task! That house is going to be spectacular when he is finished. Your skewers already are! OMG, your husband must have the patience of Job! That floor! that looks like a delicious salad, love the kebabs! 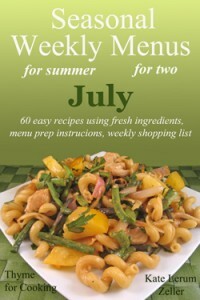 Pam, it really worked well with the salad – we like to eat lighter in summer and that was perfect! Jenn and Seth – thanks. The peanut vinaigrette really added to it.